R-62A car 1914 leads a #7 train into the Main St. Portal. Photo by David Tropiansky, May 2012. The Flushing Line (originally called the Woodside and Corona Line) was one of two lines of the NYC subway to have been operated jointly by two different divisions: the IRT and BMT. The line, built by the City of New York, began April 21st, 1917 with IRT trains running between 42nd St / Grand Central and Alburtis Avenue (now 103rd St.), and joint operation with the BMT began in 1923. The line reached Main St, Flushing, on January 21st, 1928. Elevated BMT rolling stock had to be used on this line because platform clearances were built to IRT specifications east of Queensborough Plaza, and the 67' BMT Standards, as a result, would not fit. BMT wooden cars and IRT steel cars terminated at the underground Main St terminal, but IRT 2nd Ave wooden cars terminated at Willets Point. Even though subway service started in 1917, the portion of the line under the East River was originally started by the East River Tunnel Railroad on February 25th, 1885. The original intent of the line was to connect the LIRR and the New York Central railroads. Other than an engineering survey of the East River at the tunnel site, nothing else was done, and in 1887, the company reorganized as the New York and Long Island Railroad Company. The tunnel was planned to run from approximately West 42nd St & 10th Ave, under 42nd St and the East River, to Van Alst Avenue. The rest of the line in Queens would be on private right of way, and various mappings were planned and revised for this section of route. Various problems occurred causing extensive delays and cost overruns. William Steinway, founder of the Steinway & Sons Piano Co. (and for whom the tunnel is named), became involved in 1890. He felt that controlling operations of the tunnel company would boost the value of his real estate and envisioned operating the tunnels using electricity. On June 3rd, 1892, groundbreaking occurred at 50th Ave between Vernon and Jackson Avenues. However, a series of mishaps and an underground water spring hampering debris removal, followed by lawsuits by property owners along the line forced the tunnel to be boarded up on February 2nd, 1893. Various attempts to restart the project between 1893 and 1896 (when Steinway died), and proposals to extend the line into New Jersey, all failed. In February 1902, August Belmont became interested in the project, which became known as the "Belmont Tunnels", although Belmont preferred the project be known as the "Steinway Tunnels". By May 16th, 1907, the North tube was broken through, and the south tunnel was broken through on August 7th of that same year. Because the Pennsylvania Railroad planned to build a very large station at 32nd & 33rd Streets on the West Side, and also planned to tunnel under the Hudson and East rivers, the motive power for the tunnels was changed to trolley cars. 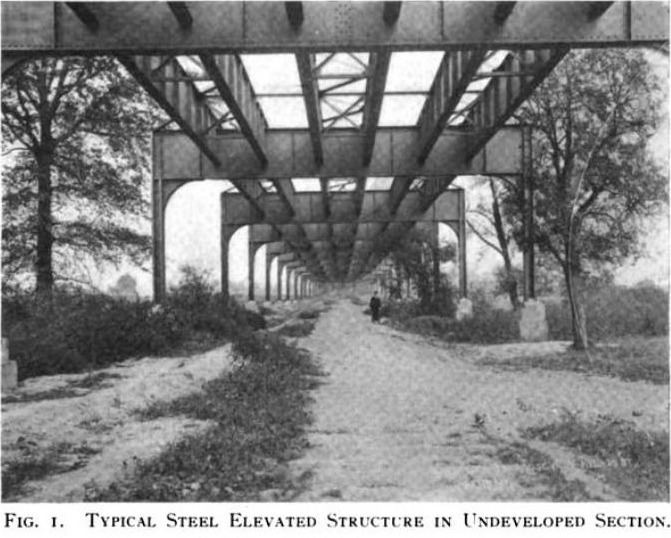 However, because of the low clearance of the tunnels, use of the typical trolley wire could not be used; instead, overhead "third rail" was hung from the roof of the tunnel using special brackets. The Van Alst Ave station was originally on a loop at the end of a 50' radius curve and was located near 50th Ave & Van Alst Avenue. At Grand Central was another loop located under Park Avenue and East 42nd St. The official opening was September 24th, 1907 for Belmont, the Mayor and other officials. However, because Mr. Belmont did not have a franchise to operate the line, and a company to run it (because of litigation with New York City), Belmont was forced to board up the tunnel. From October 23rd, 1907 until 1915, the completed tunnel was idle of traffic! On April 3rd, 1913, NYC purchased the tunnels from Belmont as part of the Dual Contracts for $3 million, and the tunnels were placed under IRT operation. With "minor" modifications, the tunnel could accommodate subway trains. Because of the steep grade of the tunnels, special "Steinway" cars were built to run on the line. With the conversion to rapid transit, the loops on both ends of the Steinway tunnels were abandoned. No vestiges of the Queens loop remain today as the Hunters Point Station occupies the site. Remnants of the Manhattan loop still exist, but are not accessible by passengers, since these remnants are occupied by machinery. The Manhattan loop is just west of the current Grand Central Station stop on the #7 line. Subway service began on this section of the line on April 21st, 1917. The line was extended to Times Square with a stop at 5th Ave & 42nd St. The line runs under the 42nd St shuttle and ends at the lower level IND 8th Ave & 42nd St station's east wall. The 5th Ave station opened March 22nd, 1926, and Times Square opened March 14th, 1927. For the 1939/40 World's Fair, the Willets Point Blvd station was rebuilt, centered on 123rd St, just west of where this station used to be. Some remnants of the old station are still visible: ironwork tends to indicate where the older outside-platform stations were, and the remains of the fare entry area can be seen east of the current station. The original Willets Point Blvd station was a "minor" stop on the Flushing Line; it had only 2 stairways and short station canopies at platform level. It was rebuilt into the much larger station seen today, and the ramp used during two World's Fairs is still in existence, but is currently not used. Express service to the World's Fair began on the Flushing Line on April 24th, 1939. In 1938, an order of all-new World's Fair cars was placed with the St Louis Car Company. These cars broke from IRT "tradition" in that they did not have vestibules at each car end. In addition, because the IRT was bankrupt at the time, the cars were built as single ended cars, with train controls for the motorman on one side and door controls for the conductor on the other. These cars spent their last days on the 3rd Ave El in the Bronx. Car 5653 still exists in the Coney Island shops, though in deplorable condition. Not to be outdone, the BMT rebuilt 90 open gate cars into closed-end cars that became known as the "Q" Types. The BMT showcase cars, the 67' standards, D-Types and multi-sectioned cars, could not run on this part of the subway because the Flushing Line was still jointly served by the BMT and IRT, with equipment that had to be manufactured to IRT standards. The Q Types were built as 3 car sets, and only the cars at the ends were fitted with traction motors and motorman controls. The equipment was repainted in the now famous blue and orange, the World's Fair colors. 9 years after the closing of the Fair, in 1949, the BMT "Q" Types were moved to the 3rd Ave El in Manhattan using old IRT Composite car trucks, and ran only as expresses, because their weight was still a bit too high for the older, local tracks. So the last BMT designed car ran on the last IRT elevated in Manhattan! Like BMT "Q" Types replacing the older gate cars that rode on the line for the opening of the 1939/40 World's Fair, the procedure would be repeated again when, in 1964, the picture window (World's Fair) R-36s replaced the (by then) older R-15s for the 1964/65 World's Fair. In 1942, when Second Avenue El service ended, major overhauls for the Corona fleet were transferred to the Coney Island shop. In addition, free transfers to the 3rd Avenue El were offered at 42nd St from June 13th, 1942 (when 2nd Ave El service ended) until May 12th, 1955 (when 3rd Ave El service ended). In the fall of 1949, the joint BMT/IRT service arrangement ended. The Flushing Line became the responsibility of the IRT, and the Astoria Line had its platforms shaved back, and became an extension of the BMT. Because of this, routes through the (then) 8 track Queensborough Plaza station were consolidated and the northern half of the structure was torn down. Evidence of where the torn-down platforms were, as well as the trackways which approached this area, can still be seen in the ironwork at the station. The Main St. Flushing station was never meant to be the terminal of the line. The Public Service Commission, in June of 1913, was actively engaged in considering extensions of the line beyond Main St., but it never came to pass. From a railfan's perspective, the Flushing Line is excellent: The rush hour express run between Queensborough Plaza and Main St is very fast. This is the only line in the subway that normally runs 11 car trains. Queensborough Plaza offers various photo opportunities. From the upper level of Queensborough Plaza, you can photograph 7 and N trains as they enter the station; facing west you have Manhattan as a backdrop, and facing east the intricate steel elevated structures. There's frequent service, so you never have to wait long for a picture. At Willets Point you can photograph the Flushing fleet resting in the sunshine in Corona Yard. The ramps built for the World's Fair now carry passengers bound for Flushing Meadow Park and the US Tennis Stadium. The LIRR also runs in that area. Clear shots of the #7 line can be obtained from this ramp facing east between Willets Point and the curve leading down towards Main St/Flushing. During rush hours, stand at 111th St and photograph express trains on the upper level center express track and imagine what the 3rd Ave El may have been like with its upper level express tracks approaching stations. This is also a good place to get yard moves in and out of Corona Yard. 7 January 1888: First proposed route mapped out. 1892: Route for tunnel finally settled upon. 1896: William J. Steinway dies. 1905: Construction resumes under August Belmont. 16 May 1907: North Steinway tube drilled through. 7 August 1907: South Steinway tube drilled through. 21 September 1907: First test trip under the East River. 23 October 1907: Cars removed from tunnel. Belmont seals tunnel pending its sale. 3 Apil 1913: New York City purchases tunnels from Belmont for $3,000,000. 13 June 1915: IRT Steinway cars enter tunnel. First test trip as an IRT line was made. 21 April 1917: Service between Grand Central and Queensborough Plaza commences. 14 March 1927: Service extended to Times Square. 1938: World's Fair IRT cars debut for the 1939/1940 World's Fair. 24 April 1939: World's Fair IRT express services debuts. 13 June 1942: Second Avenue EL service over Queensborough Bridge discontinued. 1949 (Fall): Routes through Queensborough Plaza consolidated; northern portion of structure torn down. 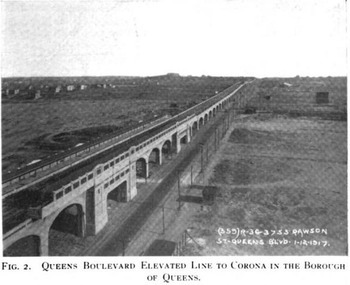 1992 to 1995: Queens Blvd viaduct rehabilitated. 2003: The World's Fair picture window R-36 "Redbird" trains finally displaced by R-62A stainless steel cars moved over from the IRT main lines. 2008: Construction begun for an extension west of Times Square to the Javitz Center. The route will pass thru the lower level of the 42nd St/Port Authority IND station. 2013: Replacement of the R-62A fleet with CBTC-capable R-188 cars begins. The R-188s are retrofitted R-142 cars displaced from the IRT main lines augmented by several new trainsets. Each ten-car R-142 set will also receive a new eleventh car inserted into the consist. 13 September 2015: New extension and station at 34th Street-Hudson Yards opens. It is the first new New York subway station to open in over 25 years. Around 2005, planning for the new 34th Street-Hudson Yards station was begun in earnest, as it was a key component of New York City's bid for the 2012 Olympic Games. Despite not winning the Games, bonds were issued in 2006 to fund the extension, and in 2007, the $1.1 billion contract was let. Construction began in 2008, with tunneling completed in 2010. Outfitting the tunnels and station took another five years. The station was opened on September 13, 2015; however a secondary entrance at 35th Street will not be completed until circa December 2015. The station is a multi-level affair with a ground level entrance, upper mezzanine, lower mezzanine, and platform level. The primary entrance, at Hudson Boulevard between 33rd and 34th Street, features a glass canopy designed by architect Toshiko Mori. The secondary entrance at 35th Street will feature a smaller similar canopy also designed by Mori. At the primary entrance, there are escalators and an elevator between ground and upper mezzanine. The secondary entrance will only have escalators. At the upper mezzanine are the fare control barriers and a large station services center (the modern token booth). The upper and lower mezzanines are connected by escalators and an "inclined" elevator, first of its kind in the New York subway although similar elevators exist in other transit systems. (It was in fact this elevator that caused some months of delay in opening the station.) The platform is an island platform with two side tracks. The tracks continue past the platform approximately to 26th Street, long enough to store two 11-car trains each. Eight staircases connect the lower mezzanine to the platform, which is unusually wide for a New York subway station at 35 feet wide. The platform is one of the deepest in the system at approximately 125 feet below street level. There are three mosaics by artist Xenobia Bailey, entitled Funktional Vibrations, located throughout the station. The Flushing line station consists of one island platform in between two tracks. As part of the larger Times Square complex, this station was actually built last, and runs approximately under 41st Street, but is the deepest of the platforms. There are various stairways and escalators leading to the different mezzanine and intermediate levels, too complex to fully describe here. One island platform in between two tracks. Ornamentation is limited to a numeral "5" in the tile band. The station has a full length mezzanine directly above the platform and tracks. The full-time fare control is at the east end. Exits lead to the south side of 42nd Street outside the New York Public Library, and via a long passageway to the larger mezzanine area of the IND subway line at 42nd Street & 6th Avenue. One island platform in between two tracks. Recently renovated with the addition of new lighting and an ADA-compliant elevator at the Lexington Avenue exit. The Grand Central station was originally constructed as part of August Belmont's "Steinway Tunnels" project, described in the Flushing line overview and more completely in a 1960 Electric Railroaders' Association publication entitled The Steinway Tunnels (1960). The length of line from here at Grand Central to Vernon-Jackson Aves. was constructed between 1905 and 1907, designed for operation by streetcars. The original station, with its western edge at Lexington Ave. was accessible through a temporary building at 156 East 42nd St. via a long staircase down to the single platform 65 ft. below street level. The streetcar operation lasted only a month due to legal issues and the tunnel and stations lay fallow until 1915. For subway operation the 181 foot platform at Grand Central needed to be extended and widened. The original tube tunnels ran all the way to a loop under Park Avenue, so the platform extension effort took advantage of this by removing the rock from in between the existing tunnels. At the western end, the southern tube was pushed outwards to allow a wider platform and a shaft containing three elevators and a stairwell up to Grand Central Depot near the east side of Park Avenue. The former tubes and new platform were roofed by a concrete arch ceiling. Another exit, at around the west side of Lexington Avenue, leads directly to the IRT Lexington line platforms. In later renovations the Park Avenue-end elevators were removed and the stairs replaced by an escalator bank with a mid-point landing, and an elevator was added to the Lexington Avenue exit as well as to the Lexington subway platforms. A diagram indicating the respective locations of the Flushing line and Lexington line subway stations. The Lexington subway transfer and Park Avenue former elevator shaft locations are visible. Two side platforms alongside two tracks. A black wall separates the two tracks for most of the station. Fare control is at the platform level at the Vernon Ave. (south) end, and three steps above the platform at the Jackson Ave. (north) end. There is no crossover or crossunder. The name tablet shows "Vernon-Jackson Aves." and there are directional mosaics "to Vernon Ave." and "to Jackson Ave." The construction and early history of this station and the tunnel to Queens are extensively described in the ERA publication The Steinway Tunnels (1960). Two side platforms alongside two tracks. Mosaic decoration includes "HP" tablets and large name tablets. The token booth is at the north end of the mezzanine, which allows a crossover between directions. This station has tiled I-beams with "HP" in large type in the tile. At the eastern end of the station, the tunnel portal is easily seen. Two side platforms alongside two tracks. This elevated station has full windscreen along the platforms. Exit is at the south end via a mezzanine, which allows a crossunder between directions. This station was renovated in 2011, which added ADA accessibility and upgraded styling on the platform windscreen. Additionally, a transfer was constructed to the IND Queens Boulevard Line. In 2005, this station was listed on the National Register of Historic Places. Two levels; one island platform and two tracks on each level. This station is shared between the IRT Flushing Line and the BMT Astoria Line, and is unique in being the only station with across the platform transfer between the BMT and IRT and their differing car width specifications. The station's upper level serves Queens-bound trains, and the lower level serves Manhattan-bound trains. The Flushing line train uses the southern track on each level. The lower level has walls on the track-side edge, with windows of frosted wire glass on the upper half of both walls. From this level, there's another flight down to a mezzanine which has a concrete ramp across Queens Plaza North to the second floor of a building. A new computer-assisted tower is being installed in a new structure on the south end. Local station with two side platforms alongside three tracks. This station has recently been renovated in-house by NYCT employees. The mezzanine at the north end, at 34th St., has a crossunder between directions. The center exit, to 33rd St., has dual fare controls preventing crossunder. The walls are concrete on the lower half with upper windscreen the full length of the station except for a small gap at the south end, and at the north end of the southbound platform. Local station with two side platforms alongside three tracks. Exit is in the center and at this time has no crossunder due to dual fare controls. Renovation by NYCT employees will include a crossunder. The mezzanine is tile. The north end has gaps in the windscreen on the southbound platform and no gaps on the northbound platform. New stained glass artwork has been installed along the platforms. Local station with two side platforms alongside three tracks. This station has recently been renovated by NYCT employees (as opposed to outside contractors). The north exit leads to 47th St. and the south exit to 46th St. Both exits have slate blue tile walls and tile floors and offer the ability to cross over between directions during the hours each entrance is open (the 47th St. entrance is part-time). New lighting has been installed on the platforms, and new stained glass mosaic artwork installed in the windows, including one panel depicting various baseball scenes (which might more appropriately be installed at Willets Point/Shea Stadium!). Local station with two side platforms alongside three tracks. This station has IND-style fare control grilles. The north exit now has a high exit turnstile to 53rd Street (the token booth and crossunder have been closed), and the south exit at 52nd St. has a full wooden mezzanine and crossunder. The platforms have full windscreen treatment with only a small gap on the southbound platform. Express station with three tracks and two island platforms. This station has recently been renovated. The exit is in the center with a new A.D.A. compliant elevator to each platform. The fare control is of the IRT grille design. New signs are over the old signs. This station is over the LIRR Woodside station which is also being renovated. Local station with two side platforms alongside three tracks. At the far north end of the northbound platform is a closed work stair leading to a storage area below the tracks. The single wooden mezzanine has a token booth at the center and a turnstile bank at either side. Both turnstile banks lead to a waiting area/crossunder and have one staircase going up to each platform. Local station with two side platforms alongside three tracks. There are two exits, both of which connect to the IND Queens Boulevard line via five long escalators, three at 73rd St. and two at 74th St. The north mezzanine at 74th St. has a wood floor with windscreen on the stairs. The wood mezzanine has a rubberized floor and a booth with crossunder. The south exit at 73rd St. leads to a wooden mezzanine with wooden stair walls, no windows, and no booth (the booth being in the IND entrance at the street level). From the mezzanines there are 54 steps to the IND mezzanine. The canopy at the south end is different and appears to have been added later than the original canopy. Local station with two side platforms alongside three tracks. This station has a center exit from the platforms and no windscreen treatments at the ends of the platforms. The mezzanine has a crossover and dual fare controls. The mezzanine is wooden and has brick over concrete flooring. Artwork is limited to a large "82" between the two exit stairs on each platform to the mezzanine. Local station with two side platforms alongside three tracks. Exit is at the center which leads to a wooden mezzanine and a crossunder. Artwork here consists of translucent panels in the windscreen at the stairs. There are covered old signs at this station which escaped the windscreens at the ends of both platforms. Typical steel elevated structure in undeveloped section. Express station with two island platform and three tracks. Exit is via a center wooden mezzanine, which features red brick concrete paved flooring and IND-style fare control grilles. A crossunder is present. The station was renovated in 2007, including new ADA accessibility. An elevator from the street runs to the mezzanine and up to a new enclosed overpass above the platforms. From this overpass, two more elevators lead to the platforms. Local station with two side platforms alongside three tracks. Exit is in the center of the platform via a wooden mezzanine, featuring a crossunder and windows. The fare control is IND type and the station has covered old signs. This station's only entrance-exit is an elevated station house beneath the tracks. A pair of staircases from either side of Roosevelt Avenue between 103rd and 104th Streets go up to the station house, where there is a token booth in the center and a turnstile bank on either side. This station opened on April 21, 1917, as Alburtis Avenue. It was later renamed 104th Street, giving the possibility of a sealed exit at the north end, before taking its current name of 103rd Street – Corona Plaza. Local station with two side platforms alongside four tracks, with one express track above. There is full windscreen along the platforms except at the north end of the southbound platform. Exit is at the south end. The mezzanine and stairway landing are wooden. The fare control area flooring is concrete and the station has a crossunder between platforms. New signs have covered the old signs. There are four tracks on the level of the platforms, the center two are used as yard leads to nearby Corona Yard. The express track bypasses the station on a flyover track above the level of the platforms. R-62A car 1891 leads an express train at Willets Point-Mets. Photo by Christopher Henderson, July 2012. The station at this location was built new for the 1939 World's Fair, replacing the former Willets Point Blvd. station which had been slightly further east (toward Main St.) at a position closer to Flushing Creek. The new station was built to accommodate crowds bound for the World's Fair, held twice on the site in Flushing Meadows south of the elevated track, and more frequently for events at the U.S. Tennis Center on the south side and baseball games at Shea Stadium on the north side of the tracks. The platform arrangement at Willets Point is unique in the system, arranged in this manner: north side platform, Manhattan-bound local track, bidirectional express track, island platform, Queens-bound local track, south side platform. Trains to Main Street open up on the island platform; the south wall platform was used for the 1964-1965 World's Fair special trains and during events at the U.S. Tennis Center. Local trains to Manhattan use the north side platform. Express trains use the island platform in each direction. The platform ends have no windscreen protection giving a postcard view of Shea Stadium, the U.S. Tennis Center, and the Unisphere, left over from the 1964 World's Fair. Underneath the platforms, the station has a full-length wooden mezzanine. There are stairs and a ramp between the mezzanine and the north side platform for crowds heading back to Manhattan. A ramp provides access from the mezzanine to the Shea Stadium parking lots. On the south side, there are ramps connecting the mezzanine and south side wall platform to a foot bridge to the World's Fairgrounds. The foot bridge crosses over a subway yard and a set of LIRR tracks. Departing Willets Point, the subway line and Roosevelt Avenue cross Flushing Creek and the Van Wyck Expressway on a double deck bridge. After crossing the bridge the tracks descend back into a short tunnel and arrive at the terminal station at Main Street/Flushing. This station has recently been renovated, with a new fare control and ADA-compliant access created at the east end of the platforms. There are two island platforms, with new "M" and "Main Street" name tablets on the track side walls. The original street exit is in the middle of the platforms with a separate fare control mezzanine above the tracks. The new fare control area at the east end has an extremely high ceiling, approximately 40 feet below the street level, and provides an elevator, three escalators, and a stairway to street level at Lippman Plaza. New artwork is installed over the row of turnstiles. Steinway Tunnel Opening (1915), New York Times, June 20, 1915. Two Lines of the Dual System In Operation (1915). Public Service Record, June, 1915. Important Rapid Transit Link Opened (Flushing-Ely Extension) (1916), Electric Railway Journal, November, 1916.